The VTAC® LBE MOLLE Vest is engineered to excel in demanding operational environments, and is built from stiffened mesh nylon that provides outstanding structure and resilience while remaining lightweight and breathable. Short = 5'3 - 5'7 1/2", Regular = 5'8 - 6' 1/2", Tall = 6'1 - 6'3", Tall sizes have 2" added to body and sleeve length. 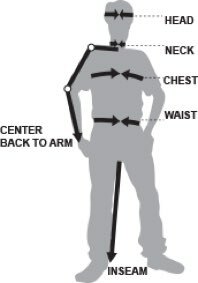 *Arm length refers to your actual arm length, not the garment’s sleeve length. A tight, compressive fit. A body skimming fit. Not compressive. A comfortable, professional fit. Neither slim nor oversized. A full, generous fit allowing superior range of motion.